News of the closure of Creative's first lifestyle store in the heart of Singapore's shopping district broke out last week, leading to speculations that Creative might be facing a financial crisis too big for it to handle. When we visited the store two weeks ago, the place was already vacant and Creative confirmed that it has closed down the Marina Square branch. Although Creative did not give an official reason for its closure, people familiar with the case cited rising rent prices as one of the main reason for the closure. "It's simply a business decision. Nobody pays this sort of rent anymore, especially in this kind of climate." 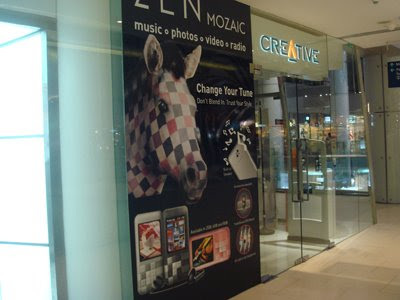 Creative's decision to re-open the branch lies mainly with the mall's decision to give in and reduce the rent substantially. The store is expected to re-open in "one or two weeks" time, so in the meantime, you can also give in to temptation and shop at the Creative online store. Promotions going on now include really great refurbish deals (ZEN V Plus 2GB - $39 or ZEN Vision: M 30GB - $169) and new combo deals, check it out here. Update: Creative store Marina Square will officially re-open on the 13th of March.